So Hardy, it Grows Indoors or Out… reportedly withstanding brief temperatures as low as 22 F. If you live in a colder climate, you can easily move it inside for the winter. Your tree will continue to bear fruit and brighten your home. Its vivid yellow/orange fruit against its glossy evergreen foliage will make this your all-time favorite houseplant. A Great Tasting Lemon. Meyers are naturally sweeter than standard lemons. My children make healthy, nutritious Meyer Lemonade with just lemons and water… no processed sugar or artificial sweeteners. 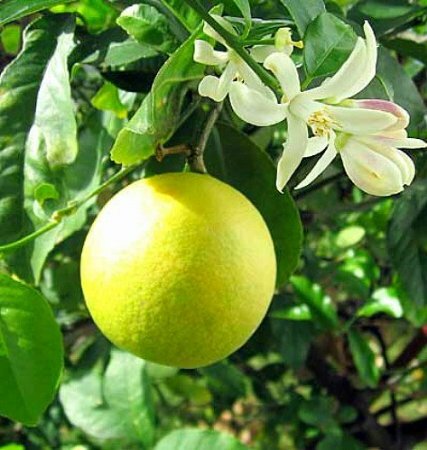 Amazing Citrus Blossoms Fill Your Home or Yard with a Fresh, Delightful Scent. The fragrance is almost like a jasmine/citrus blend. This is a FUN Tree. It’s almost always doing something. Either it’s fruiting or blooming. When friends come over, they will want to see what’s new with your Meyer Lemon… it’s almost like having a pet. Trouble-Free Citrus Tree. Highly adaptable and forgiving… just give it a little organic fertilizer and water occasionally. Long lived - capable of producing fruit for over 30 years. If you bring it indoors, try to place it within 6 feet of a sunny window. Patio Sized Meyer Lemon Citrus Tree At Last! Full sized, edible Citrus fruit can be grown anywhere inside or out of doors in a sunny location, in a container as long as the temperature is between 55F and 85F. Our select Citrus Trees will produce true to type. This lemon will quickly grow to a height of 2 to 3 feet when grown as a container plant. The size of the plant is determined by the size of the pot. These plants will happily spend their entire life in a 1 to 2 gallon pot indoors. If planted outdoors year-round, directly in the ground, these trees will get 5 feet tall. These trees will start bearing fruit within the next 12-18 months. This patio meyer lemon tree is grafted onto a well formed root system and is actively growing in its pot in a peat/soil growing mix and is 9 to 13 inches tall. Upon arrival in your home, it will need to be re-potted into a gallon container with drainage holes, using either cactus or well draining standard houseplant potting mix, within the next 60 to 90 days. Your tree will NOT arrive with fruit on it as shown, your tree is one year from looking like the picture shown. ships in a growers pot current 8-14 inches tall. Please allow 1-2 weeks for shipping during the Winter and early Spring months. We cannot ship citrus to; American Samoa, Arizona, California, Florida, Guam, Hawaii, Lousiana, Northern Mariana Islands, Puerto Rico, Texas, Virgin Islands as per USDA Regulations.